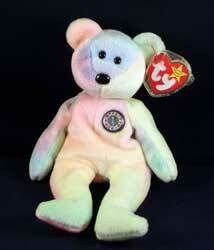 Find original Ty Beanie Babies for sale on this page. There are still many collectors of beanie bears and many of the Ty bears can be found second hand in charity and thrift stores. However the best place to seek out unusual or rare beanie babies still has to be Ebay. I have pulled together the latest beanie babies for sale on this page to make the search easier for you. I also list any of my own rare beanie baby finds here too. Description: He is multi colored and has original Ty ear tag and bottom tag and comes with fixed original Birthday bear badge with a single candle. Has the bear bean played with? Does the bear have both its original tag and tush tag?